After 8 months, Sam Zell is finally in control of the Chicago Tribune and the rest of the Tribune companies. 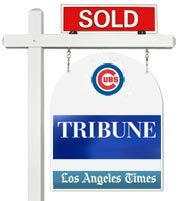 The $8.2b buyout of the newspaper and media conglomerate that operates the LA Times, Chicago Tribune, and twenty three TV stations around the country closed Thursday without a hitch. Shares ceased trading at the close of market. The second cash installment for the leveraged buyout was provided by JP Morgan Chase, Merrill Lynch, Citibank and Bank of America. Including the assumption and repayment of existing debt, the LBO will have a value in excess of $14b. In consideration of the substantial debt load, Standard and Poors and Fitch both lowered the corporate credit rating. S&P dropped the rating from "B+" to "B." (Bonds are rated in order of increasing risk of default. The scales begin at AAA and run to AA, A, BBB on downward to C. Below C debts are in default. Anything below triple B is considered high risk, or a junk bond). At the time of the shareholder vote in August, S&P downgraded the company from "BB-" to "B+." In his first move as Chairman of the now private company Zell, famous for his real estate successes and blunt style, appointed himself CEO. “What this company needs is an owner. It needs someone who accepts the responsibility for what this company does.” He said. For now, he’ll be that person. Technically, as a private company, Tribune will be a nonprofit organization owned by an employee stock ownership plan. Zell’s personally invested $315m in the transaction. He holds the right to buy up to 40 percent of the company in the future. In addition to defining his own role, Zell also named two new executives and five board members. He characterized his appointees as "non conventional thinkers." Some have questioned Zell’s choice to acquire a media company speculating that it’s outside his area of expertise. While Zell is known for his success in real estate, this is not his first entry into media. In the 90s Zell was a co-purchaser of Jacor Communications, a radio company bought for approx. $80m and then sold in 1999 to Clear Channel for $4.4b (with Zell’s Zell/Chilmark Fund LP earning a profit of more than $1b on the deal). As for his strategy for turning around Tribune, Zell was somewhat guarded in his remarks. In a prepared statement he said "Tribune, along with the newspaper industry, has been mired in its monopolistic origins, and we intend to create a fresh, entrepreneurial culture that is fast and nimble, and which rewards innovation." The root of that culture shift will likely start with a new organization structure. Zell was not shy in taking shots at the slow decision making and bureaucratic history of the company. "Up until now, [Tribune] has been run as if it was one media company. I don’t believe that’s the optimum structure," he said. The one sure thing about Tribune’s future is the Chicago Cubs won’t be in it. Last week, Tribune asked the state of Illinois to consider acquiring Wrigley Field through the Illinois Sports Facilities Authority. Zell also confirmed the intent to sell the Cubs by opening day of the baseball season. If no stadium deal happens, he may sell naming rights for Wrigley Field. Large Chicago area companies including Motorola, Allstate, Kraft Foods or McDonald’s could all theoretically be interested. Second only to Fenway, Wrigley has been hosting games since 1916.